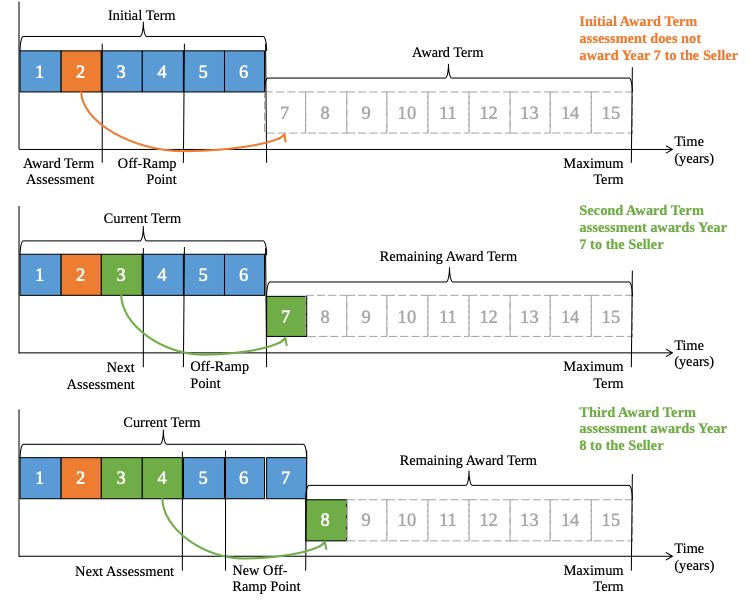 Having described the both the key elements and operation of an Award Term in the previous 2 posts (see Award Term – Part 1 and Award Term – Part 2), to aid in our understanding I will now look at 3 scenarios highlighting how an Award Term contract will work. 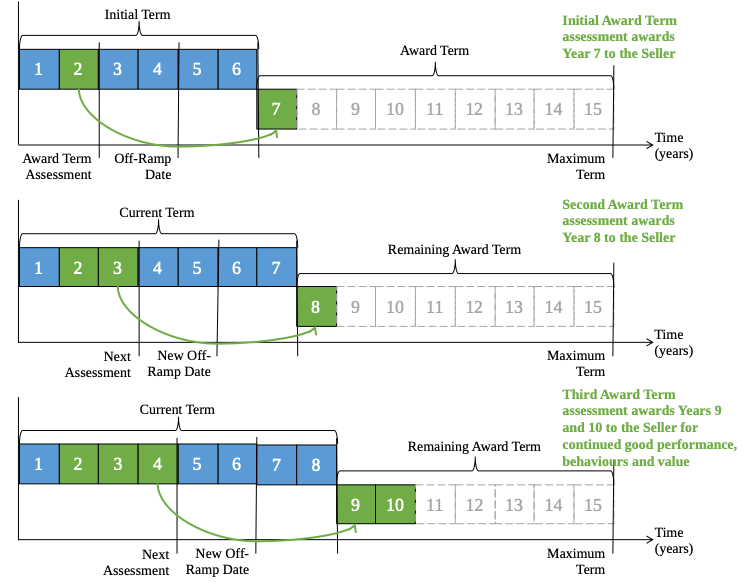 In scenario 1, consider the original example from the first post (see Award Term – Part 1) where the seller is delivering good performance, behaviours and value. This scenario is shown in the figure below. In this scenario in year 2 of the contract the buyer undertakes the Award Term assessment process resulting in a satisfactory rating. In this case (i.e. the first Award Term) the buyer would only grant 1 additional year (i.e. year 7). If the seller continues to deliver good performance, behaviours and value in through the Award Term assessment process the seller is again given a satisfactory ratingand is granted 1 additional year (i.e. year 8). In year 4 of the contract, given the seller has continuously delivered good performance, behaviours and value the buyer grants an additional two years (i.e. years 9 and 10) to the contract term. Scenario 1 highlights the ability of the buyer to vary the amount of contract duration awarded through the Award Term process. 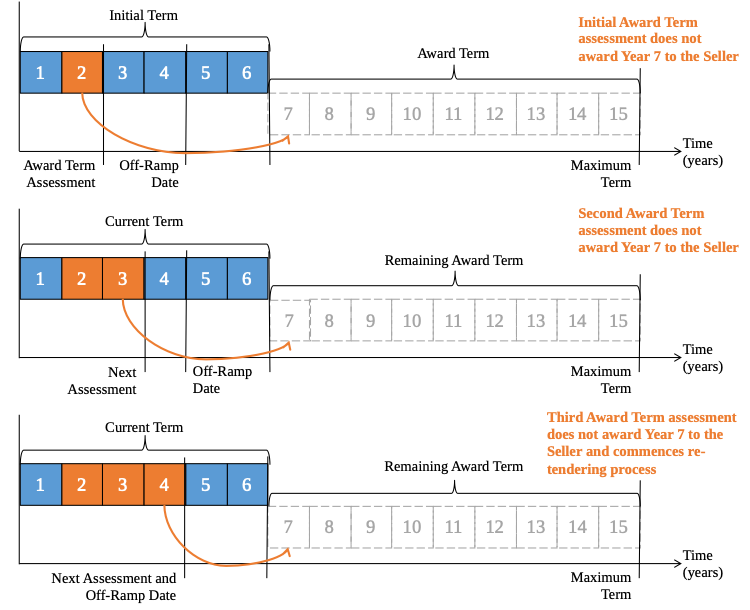 Moreover, while it is unlikely that an initial Award Term would be longer than the minimum duration (e.g. 1 year in our example), it does highlight continued, long-term good / superior performance, behaviours and value can reward the seller with longer Award Term durations. Unlike scenario 1, in scenario 2 the seller is delivering poor performance, behaviours and value. This scenario is shown in the figure below. In year 2 of the contract the buyer undertakes the Award Term assessment process resulting in an unsatisfactory rating. In this case the buyer would not grant any additional contract term beyond the original contract term (i.e. 6 years). During year 3 the seller continues to deliver poor performance, behaviours and value and again is assessed as unsatisfactoryand not grants an additional year of contract term. The original contract term of 6 years remains. Importantly, should the seller be assessed as unsatisfactory in year 4 of the contract the Off-Ramp Date will be reached resulting in an automatic re-tendering activity for some or all the contract scope. Scenario 2 highlights the buyer’s ability not to grant additional contract tenure through the Award Term assessment process for poor performance, behaviours and value. Moreover, it highlights that for continued poor performance, behaviours and value the contract will “naturally expire (end)” since no contract extensions are granted. Importantly, where any of the poor performance, behaviours and value result in other rewards and remedies such as a reduction in performance fee, stop payment and termination can still apply. In scenario 3 the seller is delivering poor performance, behaviours and value during the first two years of operation. This scenario is shown in the figure below. In year 2 of the contract the buyer undertakes the Award Term assessment process resulting in an unsatisfactory rating. In this case the buyer would not grant an additional contract term beyond the original contract term (i.e. 6 years). In this scenario, given the buyer’s feedback the seller makes changes to their contract delivery approach and in year 3 the seller delivers good performance, behaviours and value resulting in a satisfactory ratingfrom the Award Term assessment process. In this situation (i.e. a previous unsatisfactory rating) the buyer would only likely grant 1 additional year (i.e. year 7) with a new total contract term of 7 years. The seller then continues to deliver good performance, behaviours and value and in year 4 again receives a satisfactory rating from the Award Term assessment process with the buyer granting 1 additional year (i.e. year 8) with a new total contract term of 8 years. Scenario 3 highlights the strength of the Award Term process to drive seller behaviours by illustrating how poor performance, behaviours and value are not rewarded, but how through remediation, the seller can recover any lost contract term by focusing on the delivery of long-term performance, behaviours and value. A fair outcome for both buyer and seller. This entry was posted in Contract Consequences, Incentives, the How and tagged Award Term, Dr Andrew Jacopino, PBC, PBL, Performance Based Contracting, Performance Based Logistics, Rolling Wave, Rolling Window. Bookmark the permalink.